The Museum of Flight Vision Statement: to be the foremost educational air and space museum in the world. Whether you have visited the galleries of the Museum of Flight in Seattle or our Restoration Center in Everett, listened to a veteran tell stories about flying for our country, enjoyed the thrill of air travel, or simply gazed up in the stars and wondered about the world beyond our own planets, you have undoubtedly experienced a glimmer of the wonder and curiosity behind this vision. The goal of the Museum of Flight Store is to capture that experience through products that are fun, educational, and that remind us of the many ways that our lives connect to air and space travel. 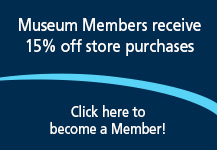 Proceeds from purchases made in the Museum of Flight store support the educational mission of The Museum of Flight. We deeply appreciate your support in choosing to shop with us.